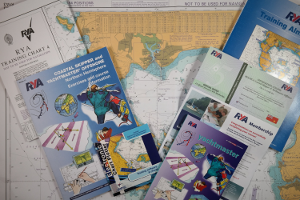 NEW FOR 2019: We now offer Day Skipper, Coastal Skipper and Yachtmaster theory online training courses with our partner skippersonline.net, Details are below, including links to sample courses so you can try before you buy, as well as a form to sign up immediately. 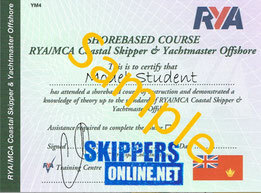 We also provide shore-based classroom courses to Yachtmaster™ Offshore level and also offer the International Certificate for Operators of Pleasure Craft (also knows as the International Certificate of Competence or ICC) and the very popular RYA Essential Navigation and Seamanship course. Please click here for more details on our classroom courses. 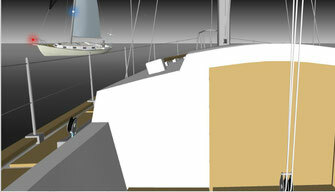 Realistic 3D graphics and videos illustrate scenarios exactly as they might appear from onboard your vessel. 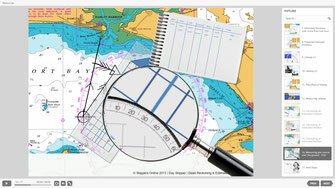 This is particularly valuable when teaching The Collision Regulations, Buoyage and Pilotage. You are carefully prepared for the final exams, which are taken online after you’ve attempted mock papers. If you don’t quite make the grade then detailed personal feedback is provided and suggestions for relevant additional study. Unlimited resits are allowed. 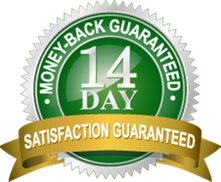 Choosing whether to study in a conventional classroom environment or online is a big decision so all students are offered a 14-day money back guarantee to ensure you are 100% satisfied with your choice. The same state-of-the art technology chosen by major corporations such as IBM, Microsoft and Sony is used. Lessons run on Windows PCs, Macs, iPads, iPhones and Android devices. If you are a member of NWCC, you can get a 10% discount off all online training fees. Please email [email protected] before signing up, to get your discount code. If you are not a member of NWCC, you can still get a 10% discount if you sign up for a year’s membership. Please click here to find out how to sign up, or pop into the Clubhouse in Conwy during opening hours. To sign up for any of the online courses, please use the form below.